Combine the garlic and salt in a mortar and pestle; mash to form a coarse paste. Rinse the basil leaves well, transferring them to a food processor without drying them — the extra moisture is needed. Add parsley, cashews, sesame seeds, lemon juice, cheese and the garlic paste. Puree to achieve the desired consistency. 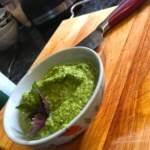 With the motor running, gradually add the oil to form an emulsified pesto. Taste, and add water (for consistency) or salt as needed. Transfer to a container. 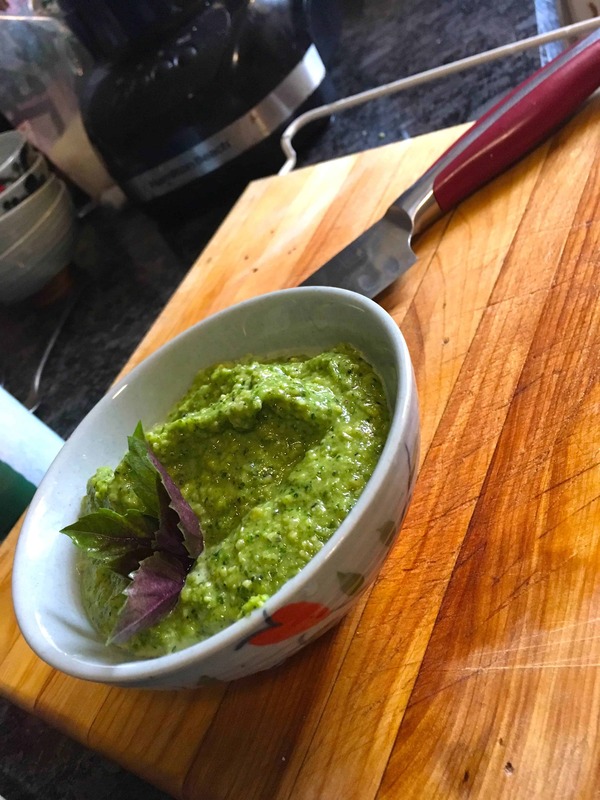 If not using right away, place a piece of plastic wrap directly on the surface of the pesto before sealing, and you can refrigerate for up to 3 days. Can be frozen up to 8 or 9 months. You can also divide it up amongst ice cube trays and freeze until solid, then transfer the frozen cubes to a zip-lock baggie and keep in freezer until needed.